I like mushrooms. Nowhere near as much as Mrs. G, though. She loves her some fungus. Sauteed mushrooms with a steak, The Pioneer Woman’s Burgundy Mushrooms, mushrooms on her pizza, mushrooms in her salad, fried mushrooms. Heck, she’d eat mushrooms with her mushrooms. That’s why I knew when I saw this recipe glancing through our new cookbook “Our Best Diabetic Living Recipes” that it would be one of the first we tried. And I’ll confess, I wanted to make them as well. I love spring time. Perfect weather allows us to hang out on the patio and sip a few cold ones while the grill chugs away. Just wish it lasted longer in Texas. That picture really has nothing to do with the mushrooms. I thought it came out really good and I just wanted to share it. 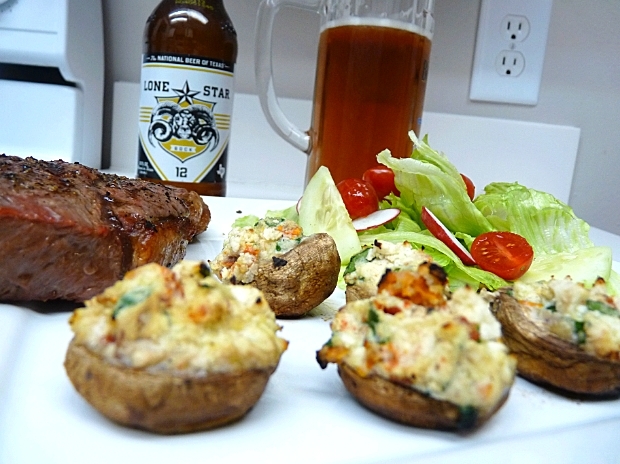 BTW, that Lone Star Bock is pretty good stuff. Ok, back on topic now. 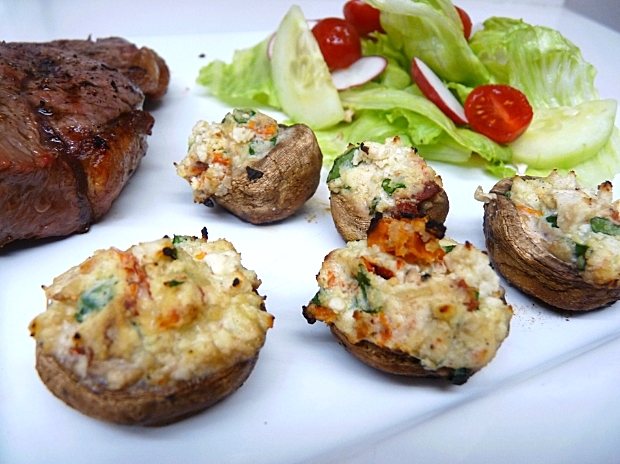 Don’t these stuffed mushrooms look mouth watering? How could you not want to try one of these? Preheat oven to 350 F (and grill to 450F if desired). Remove and discard mushroom stems (we saved them for our salad). Brush caps with oil and place stem side down. Bake for 10 minutes. 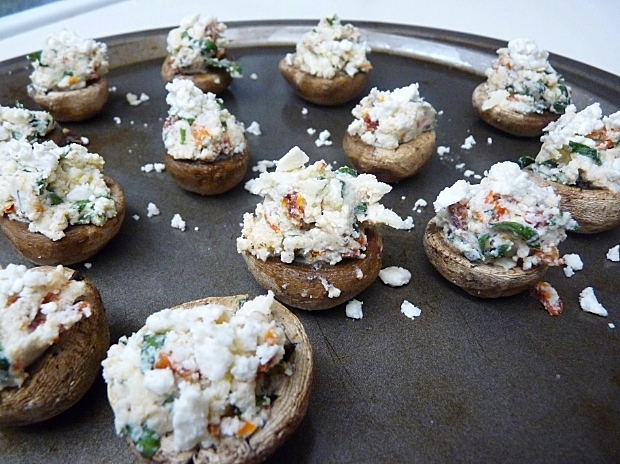 While baking mushrooms, in a medium-sized bowl, pour boiling water over dried tomatoes. Let stand 10 minutes. Drain mushroom caps and tomatoes. Set mushroom caps aside. In the same bowl, coarsely snip tomatoes. Stir in the ricotta, spinach, Monterey Jack, Parmesan, snipped basil, garlic and salt and pepper. Turn mushroom caps stem sides up. Stuff with filling and sprinkle with feta cheese. 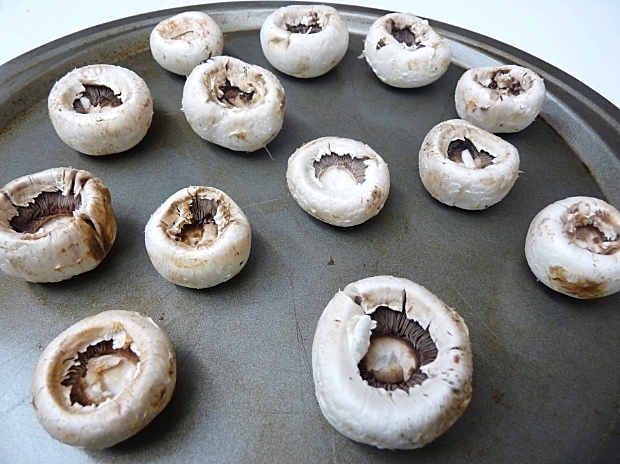 Bake the mushroom caps in your oven or on the grill at 450F for 8 to 10 minutes or until filling is heated through and light brown. Serve immediately. Per Mushroom: 42 cal, 3 g total fat (1 g sat. fat), 8 mg chol, 105 mg sodium, 2 g carb, 0 g fiber, 3 g pro. 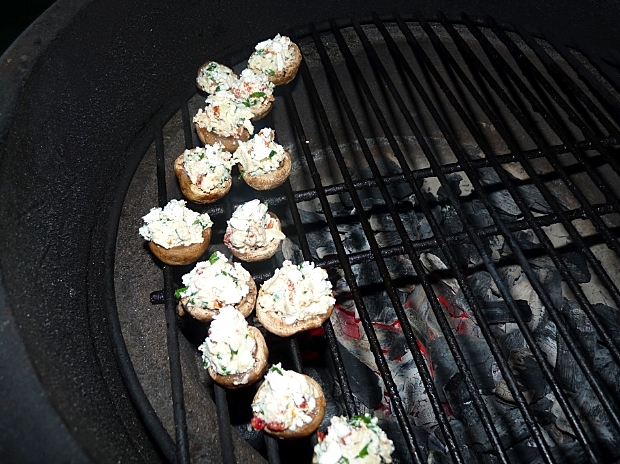 Obviously, these mushrooms can be pre-baked, stuffed and then finished off in the oven at 450F. 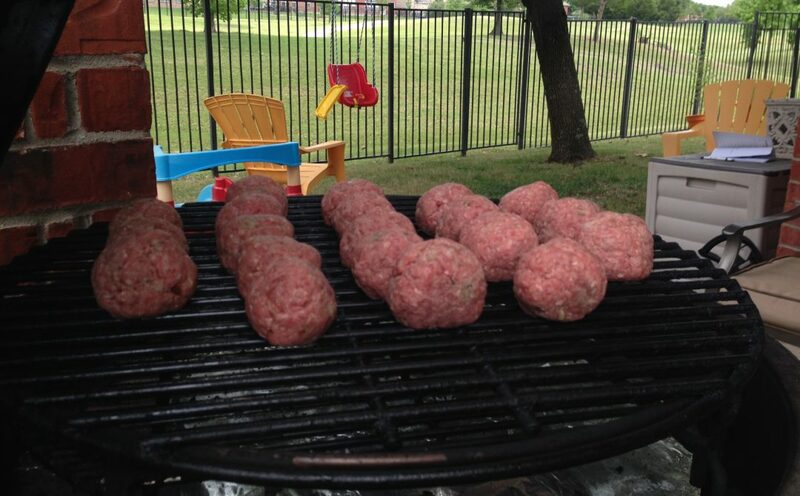 But what fun is that when you can throw them on the grill instead? Besides, it was one of those beautiful days that were perfect for sitting on the patio and I had already fired up the grill for steaks. I placed the mushrooms on the edge of the grill because its it a little cooler, they are not over as much burning, hot lump and to give me room to grill our steaks at the same time. Who wouldn’t want to get up close and personal with these mushrooms? Sorry for all the pics. I might have gotten a little excited. Not to mention, I think the pictures came out really good that night. How good does that look? Don’t you wish your monitor came with Smell-A-Vision? These mushrooms did not disappoint. Mrs. G loved them. So much, we had them again the following night. Packed with flavor from the cheeses and tomatoes and basil. Perfect blend of savory and salty and just a hint of smokiness from the charcoal. We couldn’t stop eating them. Truth be told, I thought they were better than the grass fed steaks we had (first time eating grass fed, not impressed). 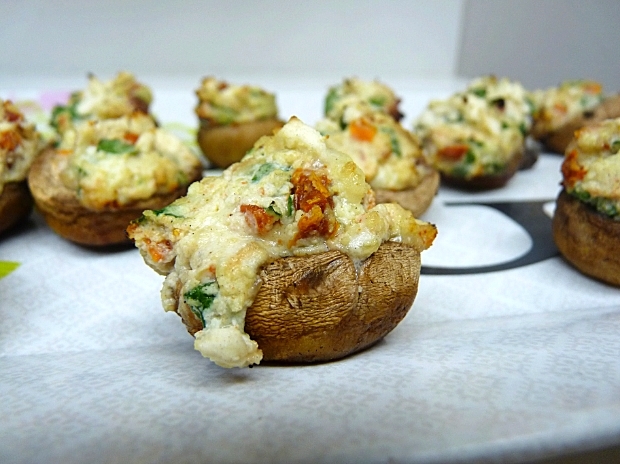 If you are looking for an appetizer or just a healthy side dish to go along with your meal, I highly recommend giving these ‘shrooms a try. I know…how can you have a follow up if you are just now posting it for the first time? 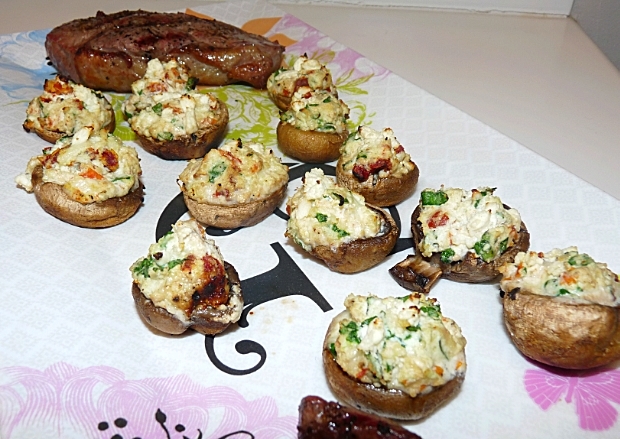 The first time we did these beautiful mushrooms, we followed the cooking directions directly from Better Homes and Gardens “Our Best Diabetic Living Recipes”. While they came out pretty good damn good, we didn’t really like the pre-baking idea. The mushrooms shrunk and we thought it might have dried them out a bit. 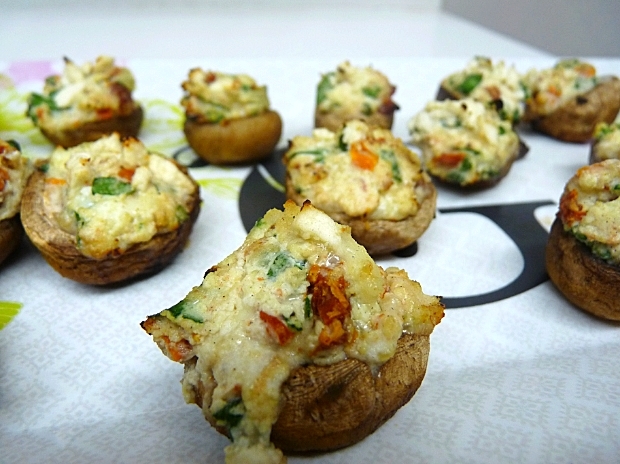 The second night, we did not pre-bake the mushrooms. Instead we just stuffed them and placed them directly on the grill at 400F. I didn’t actually time them, just pulled them when they were heated through and turned a light golden brown (sorry about that). Let me tell you…they were much better!! They were so tender and juicy! Oh how juicy they were! Try them both ways if you want, but I’m going to skip the pre-baking step from now on. I recommend you do as well. Oh my gosh, those look positively amazing. I’d eat them all. Thanks for the tip on avoiding the pre-baking. I’ll definitely take that route because dried out mushrooms are kinda gross. And eat ’em fast cause cold mushrooms are gross, too. Not that you will be able to restrain yourself and eat them slow and dignified. At least I didn’t. Sure thing, Mom. Anytime. I’ll ignore the beer comment. Love you, too. Wow! Those look great. You have a gift for food photography (and for cooking 🙂 Those pictures would convert even the biggest mushroom skeptic. One idea on the grass-fed beef — since it is generally a lot lower in fat, it doesn’t need to be cooked nearly as long as the typical feedlot stuff. I also brush it with olive oil before cooking it. (I don’t know what your dietary restrictions are, but if you are permitted to do it, a bit of olive oil goes a long way on grass-fed beef.) There are lots of resources, but this site (http://www.goodearthfarms.com/Cooking_Tips.htm) has some good basic tips. I can’t often afford a steak, but all of our burgers have been grass-fed for the past four years, and we would never go back. Those mushrooms look fantastic G!! I love anything with cheese, so four cheeses is like… quadruply good (and healthy too… can’t believe it!). Sorry to hear about your blood sugar. I have no idea what mine is, but I’m trying to cut down the sugar that my husband and I eat as a precautionary measure. We’re both sugar freaks, so it’s pretty hard. I feel so deprived *sob* (if I was a hash tagger I’d put #firstworldproblems right here). So, does that mean no more chicken fried steak? Double sob. I’ve been planning on looking into it. I would like to compare them to the Ninja. We have an old Kitchenaid blender, but its not great and don’t know how much longer its going to hold out. I do need to get some almond milk next time I am at the store. Speaking of kale…I had kale chips for the first time this weekend. Pretty good. Not quite like a chip, but good. Impressive. These sound great, diabetic or not, I’d devour a few. Yes, they do look scrummy. I will try the recipe tomorrow. I always thought that grill was a great big avocado.. I see them at Costco and they’ve always intrigued me. How do you like it, compared to other grills..? 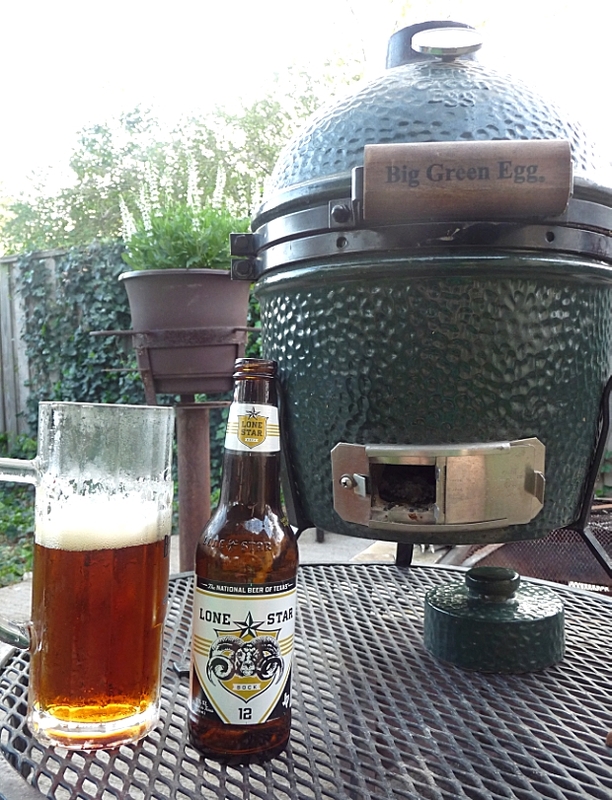 I love my Big Green Egg, so much that I bought a Mini Big Green Egg. After having it for a month or so, I took my stainless steel 5 burner gas grill to my parents house (theirs was on its last leg) and took my offset smoker down to the ranch as they just weren’t getting used anymore. I will caution you that not all ceramic cookers are built the same and neither are their warranties. Big Green Egg has a lifetime warranty on most parts. Knockoff ceramic cookers don’t usually match that, so while the Egg may cost more, the peace of mind that comes with the warranty, IMHO, is well worth it.